Motorola introduced a new deal for the week this morning that features their discreet Bluetooth earbud, the Moto Hint. 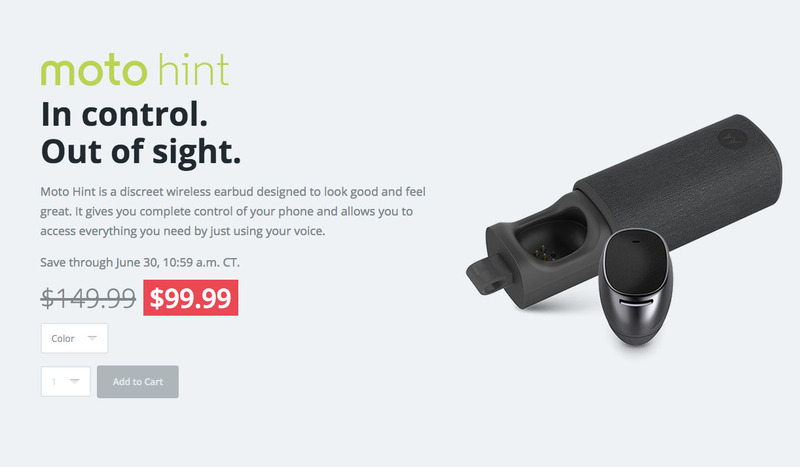 At $99, this little gadget can yours. That’s a $50 discount, in case you were wondering. We took the Moto Hint for a spin back in October of last year, finding that the idea behind the Hint is quite interesting even if it falls a bit short of our expectations. While it may not be the ultimate in-ear assistant that Motorola was hoping it would be, it’s not terrible as a Bluetooth headset, especially if you are like me, and don’t want to be the guy seen walking around with a Bluetooth headset in his ear at all times. As a recap, the Hint is a tiny earbud that allows you to not only place and receive calls, but also ask it commands like you would your phone. You could ask for the weather or directions, but also hear notifications as they come in. It automatically turns on or off as you put it in or take it out of your ear, charges through its carrying case, and comes in a variety of textures and colors (wood, leather, etc.). T-Mobile's "Un-Carrier Amped!" Kicks Off Thursday, Amping of All Things Uncarrier Incoming. Such Amp.